The City’s Main Street office celebrated the holiday season with the 2nd Annual Downtown Christmas Lamppost Decorating Contest, designed to encourage local merchants and organizations to decorate the ornamental lampposts throughout downtown. Special Project Director Tammy Gann said the lampposts are beautiful by day, but spectacular by night. 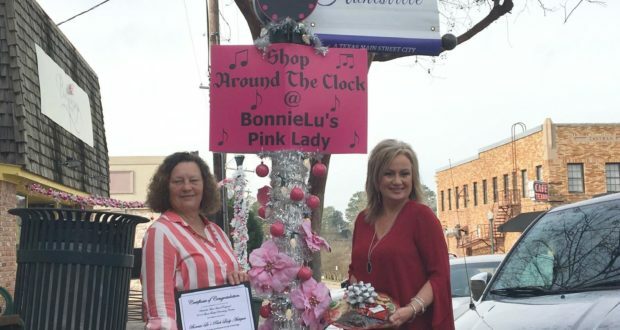 The winner for the “Best Decorated Lamppost” was awarded to Bonnie Lu’s Pink Lady Antiques, owned by Bonnie Smith. The award was presented by Gann.